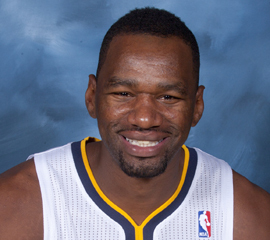 He only played with the Pacers for one season, in 2012-13, and hasn’t been heard from since in the NBA. That surprises me, because I thought he was a good enough defensive player, and athlete, to last longer. The Pacers saw him as a guy who might be able to contain LeBron James a little, but that idea didn’t really pan out. Still, Young made contributions to the Pacers team that reached the conference finals in 2013. He had a memorably bad performance in Game 1 against the Knicks that year, after which his teammates dubbed him “Tragic,” but he bounced back with some good games the rest of the playoff drive. He contributed even more to Memphis before that. He had been a second round draft pick of the Grizzlies in 2009, and started games for them in the playoffs, such as when they upset San Antonio in the first round in 2011. Before all that he had lived quite a life as the oldest of five kids with a single mother who moved nine times. He led his high school team in Maryland to two state titles, went to a military academy for a year and was a third-team All-American at Pittsburgh. He’s got a great story. He’s a really nice guy, too. He came across to me as a vulnerable guy who just needed some love. He’s an example of the type of borderline NBA player who needs to be in the right place at the right time to stick with a team. Younger guys are always coming up, and front offices tend to favor them in case one of them explodes into something big.